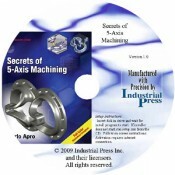 "This book explains 5-axis machining in simple terms most people in the field will appreciate and quickly understand. The colorful graphics are nothing short of amazing and generously sprinkled throughout the book with incredible detail. Dozens of machining applications are illustrated and explained while taking much of the fear out of driving these complex machine tools. Anyone associated with 5-axis machine tools has much to gain by reading this book." "… this great book will allow operators, NC programmers and anybody interested in multiaxis machining to learn and understand the reality of 5-axis machining. The crystal clear wording and perfect overview make this book easy to read and simple to understand for everyone, from beginner to expert." This unbiased, no-nonsense, to-the-point description of 5-axis machining presents information that was gathered during the author's 30 years of hands-on experience in the manufacturing industry, bridging countries and continents, multiple languages - both human and G-Code. As the only book of its kind, Secrets of 5-Axis Machining will demystify the subject and bring it within the reach of anyone who is interested in using this technology to its full potential, and is not specific to one particular CAD/CAM system. It is sure to empower readers to confidently enter this field, and by doing so, become better equipped to compete in the global market. • Features full-color illustrations through that help to explain the theories and principals. • Includes a CD containing avi files, high quality illustrations, and sample parts.